How does a SMTP server work ? 1 – Outlook Express connects to the SMTP server hosted in mail.somedomain.com.com using port 25. 2 – Outlook Express has a conversation with the SMTP server telling the destination address and the address of the sending mail, as well as the content of the email. 3 – The SMTP server takes the part of the address in the “to” (yourname@domain.com) and divided into two parts: the name of the recipient (yourname) and the domain name (domain.com). If the address in the “to” have been somedomain.com another user, the server simply had delivered the message to the POP3 server somedomain.com (using a program called delivery agent). Being the recipient in another domain, SMTP needs to communicate with that domain. 5 – The SMTP server somedomain.com connects to an SMTP server domain.com using port 25. It has the same conversation in plain text that the client had with the SMTP server somedomain.com, and delivers the message to the server. The server recognizes the domain name which delivers the message to the POP3 server, which puts the message in the inbox. If for some reason, the SMTP server somedomain.com cannot connect to the mail server of domain.com, then the message is queued. The server on many machines, using a program called sendmail for delivery. The sendmail program will try to periodically resend the messages you have in your queue. For example, you can try to resend the mail every 10 minutes. After four hours, usually sends you an email saying that there is something wrong. After five days, most sendmail configurations desist from sending email and we will resend them to us. In the next part of the article, we will see how the POP3 server works. Posted in General	| Tagged server, SMTP	| Comments Off on How does a SMTP server work ? Modules are offered by their developers for the construction of new, and to expand the existing data center. These modules include building construction, including walls, ceilings, floors and a raised floor, forming a space for communication and computer equipment, they are also equipped with systems engineering. Among the significant advantages of the data center, built from reconfigure modules include reducing the time to create and put into action by a very considerable reduction in the design, to minimize the construction work, permits and approvals of any kind. Modules are ready-to-use objects that are tried and tested during the manufacturing process engineering systems, which come fully prepared for operation. Module manufacturers are trying to increase their energy efficiency and offer engineering solutions that deliver, according to published reports, a much smaller value of the coefficient PUE, than those which characterize the power consumption of a number of traditional domestic data center. In Modular Solutions and Data Center on Demand, ESDS presented “Build a Datacenter” Solution in the Indian market. The PUE value for complex cooling, according to developers, is not more than 1.06. This is achieved largely by direct cooling outside air with high purity. The modules can be placed for 1, 4, 10 or 20 racks, and these values are in fact the “step” scaling data center. Easy scalability, which is carried out without interruption of the provision of IT services, as well as the gradual build-up of performance and power systems engineering support for the development of complex IT companies consider as important advantages of modular solutions. The scope of supply includes software management infrastructure based on eMagic Data Center Infrastructure Management Suite (DCIM Software) with the functions of remote administration. 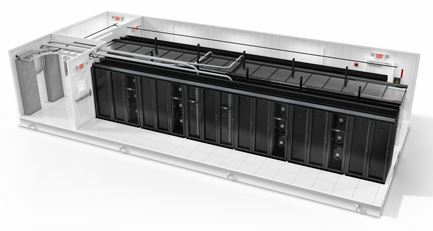 Infrastructure modules (for their used containers length of 40 or 53 feet) are designed for installation of IT equipment, power and cooling systems. They are designed for rapid deployment and can be used for the development of existing data centers and create new objects. Indian data center contains a dozen 10-kilowatt racks, redundant Row-conditioners, UPS, providing automatic fire-extinguishing system and access control. The largest project is our own data center in India, received Tier III data center certification. This data center has an area of 30,000 sq.ft and a power consumption of 1.1 MW, built from 38 modules. Big Data technologies have been giving increasing agility to understand the needs of clients from different industries. In the financial sector, it is not different. With the expansion of communication channels and service to account holders, the amount of structured and unstructured data that can be collected and analyzed on customers is increasing. The challenge for banks is, therefore, know how to use this information for the sake of business. The increase in stored data has occurred because of a new customer profile, which requires a multi channel experience and fast service on different screens. As an account holder goes to the physical agency, on average, once a month, on digital channels accessed via mobile phone or tablet this interaction can reach up to 30 times in the same period, which multiplies the possibilities for gathering information. Banking is no longer a place to go, but something you do. This new client also uses the Internet as a service channel five to seven times per month, while going to the ATM only three to five times in the same period of time. It is clear that the flow of people in agencies is steadily decreasing, while the digital channels are gaining more and more relevance. 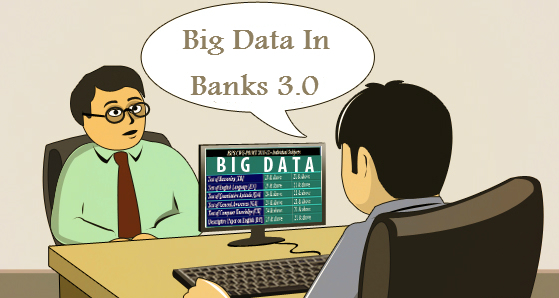 The so-called ‘Bank 3.0′ can, through technology, to be ubiquitous in the life of the customer and creates numerous possibilities in terms of collecting and analyzing information. In this new era of banking institutions, the bank becomes intelligent and multichannel needs and take advantage of it to develop new strategic direction focused on the behavior of depositors. With the ubiquitous approach for digital channels, it is possible, for example, offering products and services online, in real time, using Big Data Analytics technologies available. Thus, the offerings become more assertive and targeted since they are made based on customer preferences, and the chance to be successful increases. You can apply predictive analytics strategically to serve customers more effectively in their financial needs. In parallel, monitoring social media to engage enables customers to mitigate risk and promptly react to problems, and enrich customer data with information that facilitates more effective propositions. All this made possible by digital channels, which allow banks to discover the best insight for each profile. Ninety-seven percent of managers of online commerce in India plan to increase their investments in digital marketing. The main priorities for the year 2014 were to increase conversion rates, brand recognition and activation of new customers. But getting it is not easy. Information is State Of Search Marketing: India 2014, conducted by Exact Target. The idea is to map the points of customer interaction. Channels like Google, e-mail marketing, social networking, website, mobile, physical stores, among others and improve them, increasing the potential for conversion and recurring purchases. Collect and store data about customers. Do this through different channels. Join the most common social networks or focus on a specific network. Watch your customer relationships in these four stages: acquisition, activation, retention and engagement. Identify gaps in the stages mentioned campaigns and adopt to ensure that in all of them there is involvement with their customers. Do not attack on all channels. Come softly, choose one or two. Afterwards, think about successful strategies for other channels. Set goals and to measure the return, whenever possible. Campaigns on smartphones can be good. Evaluate whether mobile marketing is suitable to your business. Check from the amount of hits made by tablets and mobile phones. Responsive design for a website can be beneficial, adopt (if you have not used this model in your website). Everyone likes to be unique and special. Work with personalized messages of high quality and great potential returns, collecting data that you can. Customize communication in e-mail marketing, social media, mobile and cross channel. Opt for virtualization is just one of the actions that can be taken to ensure the sustainability of the environment. Recent study at Stanford University points out that from 2005 to 2013 there was a 48% increase in energy consumption in data centers in the United States. Fewer than many analysts predicted, but still significant. In an economy in constant instability, it is worth taking a look at how to increase energy efficiency in data centers, especially because in many cases the energy efficiency can be obtained without major repairs of IT equipment or facilities. The first step in making the data center more energy efficient is to find out exactly how much electricity the environment uses, and where, specifically, electricity is consumed. My first recommendation is to perform an assessment of the data center to quantify the energy use means for the company. The Green Grid has a metric to use energy called PUE that involves dividing the total energy used in an installation by the IT equipment. You do not need to be sophisticated to quantify the consumption of primary energy. Understanding the PUE can provide a perspective on how you can be more efficient. Another very simple way to record improved Energy efficiency is always evaluate carefully the account of the data center, a practice not much performed by IT departments today. It is recommended to examine utility bills in an effort to find areas that could be more energy efficient in the question. While monthly costs do not always correspond to inefficiencies, they can at least highlight where opportunities for improvement are. Once initial assessments are carried out, examining where to cut electricity usage. Specific strategies will vary from data center to data center. However, server virtualization is a common strategy that can reduce energy consumption and costs significantly by replacing many physical servers. To extract maximum virtualization, or any activity that aims at efficiency, the company has to consider the ripple effect on data center operations. If your server storage is about 80% usage, you must ensure it is monitoring the power requirements to make proper use. By implementing virtualization, the density of workload increases on certain servers, with this, power and cooling should be adjusted according to the racks of servers. A review of the cooling architecture can lead to significant savings with minimal effort. With this action, you can register for energy efficiency around 20% to 40% savings. This action can be as simple as move the air-conditioning to near virtualized servers, a strategy called close-coupled cooling. The idea behind the close-coupled cooling is to have more control over the supply of cold air and warm air capture. You can employ the right cooling required for a particular rack at the time that it takes. When virtualized servers are removed from a rack, you can create problems with the cooling and energy efficiency. Fill the empty spaces within racks, cabling, panels etc is vital in this scenario. Virtualization facilitates the creation of zones. So you can have a highly used area within the data center, which will allow literally close all other areas of the environment. In turn, the appropriate power and cooling capabilities can be located precisely where they are needed. Zones organized according to applications can also allow better load balancing data center, server efficiency and redundancy requirements. For example, back office applications can be setup in an area while mission-critical systems in another. Instead of delivering the same amount of redundant power and cooling throughout the mission critical zone can be targeted to the highest levels of redundancy and cooling. 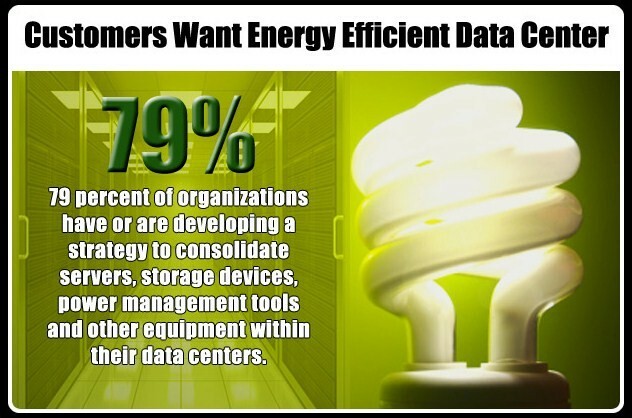 The opportunity to save energy in the data center requires looking at more variables. Efficiency load and redundancy work together to optimize energy consumption. Besides taking care of the internal air, which comes from outside should also be taken into consideration. Data centers are often maintained by increasing the temperature according to the needs of the equipment. Meanwhile, data centers can save to rely on outside air for cooling. Increasing the internal temperature of five degrees will not compromise the performance of the equipment IT, and will allow the data center to enjoy the days of cold outside to keep the proper temperature.’s economy generated using this method can be seen quickly. It is possible to record energy savings of 50% or more every hour that the company use the economy mode. Optimize energy use across the data center can be a time consuming exercise, but following these relatively simple steps you can register major economies.